Microbes bring agricultural biotechnology to the Triangle. Jeff Dangl in the greenhouse. 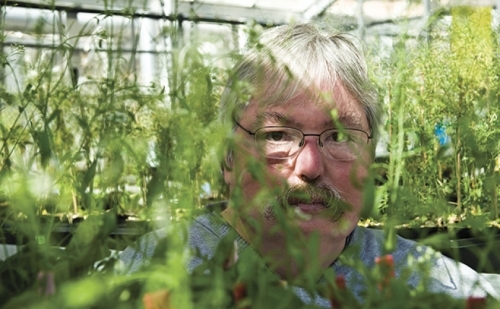 Jeff Dangl isn’t a doctor—he’s a plant biologist. But he’s right about my guts. The trillions of microbes in my intestines help me break down food and absorb nutrients. I knew that much. But I never realized that it works the same way for plants. Instead of digestive tracts, plants have millions of bacteria on their roots and in the soil. Some of these microbes may be opportunistic hangers-on or even foes—but many actually help plants grow and thrive. 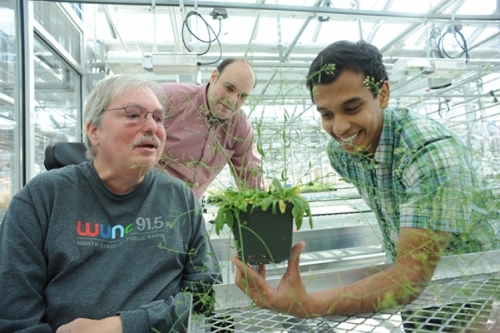 Jeff Dangl, a plant biologist; Vladmir Jojic, a computer scientist; and Surge Biswas, a statistics major, collaborate on plant genomics research. A custom-made cocktail of microbes, applied to a plant or a seed, could increase crop yield, protect the plant from drought, and fight off pests without using insecticide. But before agricultural biotechnology companies can start making microbe recipes, they’ll need to know which microbes work best and which ones go together. 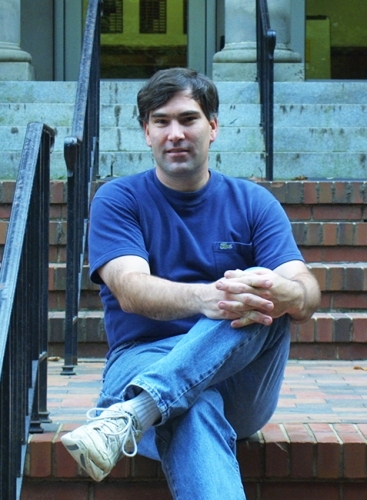 For that, scientists like Dangl at UNC are discovering what each bug does and whether it should be part of the mix. Joe KieberA microbe that seems good at fixing nitrogen, for example, doesn’t always fix nitrogen. “It might do great in the field from whence it came, but if you take it to a different microbial community, it doesn’t work,” Dangl says. There are millions of microbes in the soil around a plant, he says. Thousands on each leaf. That’s an astronomically high number of microbe-to-microbe relationships to figure out. For areas struggling with drought, we could use microbes to help plants grow with less water, Kieber says. But drought resistance isn’t just for East Africa and other already-dry places. Worldwide, more people and more pollution means that less fresh water is available for irrigation each year, so many plants could use a microbe boost to help them grow in drier soil. Hardier plants, better crop yield, protection from insects and pathogens—these are the goals of the fast-growing agricultural biotechnology industry, which has taken off in North Carolina’s Research Triangle. BASF, Syngenta, Bayer, and Monsanto each have centers here, along with many small startups. Earlier in 2014, one Danish biotech company, Novozymes, was trying to decide where in the United States to build a new research facility. After a meeting with Triangle-area universities, Novozymes started talking with Kieber, Dangl, and a few other UNC microbiologists about what the company hopes will be a years-long collaboration with UNC to make microbe cocktails. “When you develop a product, you need all the pieces in place in a lab setting to tell you if it’s going to work,” says Thomas Sorensen, director of R&D at Novozymes. “That basic research is going on at UNC.” Novozymes announced in April that it will build its new research center in Cary, North Carolina, where it will employ 100 people. Many skills and steps go into building a plant-enhancing microbe cocktail, Dangl says. The microbes have to survive shipping. Then they have to survive being stored on a farm in a barn that might be scorching hot in summer and well below freezing in winter. Finally, the product has to scale up—you have to be able to make a lot of the bacteria. If there are millions of microbes on and around a plant, how do you tell which ones are helpful? Instead of investigating all the bacteria, Dangl says, he lets the plant be his guide. Out of the thousands of types of microbes in the soil around a plant, only a small fraction—meaning hundreds—make it inside a plant’s roots or onto its leaves. Some of those microbes are probably unwelcome invaders, but Dangl figures the plant lets at least some of them in on purpose. His lab has found that many plants share a core microbiome: a set of microbes that live in and around the plants. The more closely related two plant species are, the more similar their microbiomes. Some bacteria, we know, supply plants with food. “The plant makes sugar from the sun, and that sugar, that carbon, gets pumped out of the roots in forms that attract microbes that have phosphorous. The microbes bring the phosphorous to the plant and eat the carbon,” Dangl says. Other microbes fight off bad bacteria that cause disease. The plant in turn can help the microbes by making food for them and improving the pH of the soil. Dangl and his team test these communities of microbes by applying them to genetically identical plants and then exposing the plants to rough conditions, such as low phosphate in the soil. After six weeks, they evaluate the plants—which ones look healthy and large, and which look unhealthy and puny? “We look at the top 5 percent of performance—do they share some community members?” Dangl says. By “community members,” he means bacteria. The ones that show up in the plants that grew well are candidates for further study. When these cream-of-the-crop bacteria have been thoroughly tested, they may make a stop across the hall, in the lab of Elizabeth Shank. Here, Shank’s lab uses advanced imaging techniques to minutely measure everything going on in a sample of bacteria. Many plants have only a single gene that protects them against a harmful microbe, Dangl says, and the microbe can eventually mutate around the gene. Build in a second gene to resist the same pathogen, and you double the amount of time it takes a microbe to evolve its way around the plant’s defenses. A few years ago, just finding these helpful genes was very difficult, Shank says. How do you take a handful of dirt and find the one tiny microbe with the one gene that might do what you want? Today, scientists use gene-sequencing equipment in facilities like UNC’s Genome Sciences Building to read all the DNA in a sample quickly and completely. Genetically modified plants can be controversial, but it’s hard to ignore the environmental benefits, Kieber says. “The right cocktail of bacteria could improve the efficiency with which plants take up fertilizer—so maybe you could use less fertilizer, which would save the farmer money and would also mean less runoff into lakes and rivers,” he says. And genetic modifications for pest or disease resistance mean fewer chemicals sprayed on fields. Genetically modified cotton, for example, makes a protein called Bt that’s harmless to animals but kills insect larvae. “Thousands of tons of pesticides are no longer sprayed in this country because of genetically modified cotton,” Kieber says. It’s the same way with fungi and other pathogens that attack plants—genetically engineer resistance to one, and others will eventually take its place. To help feed the world, UNC plant scientists will have to stay a few steps ahead.